Participated in consultation with Federal Government on proposed LLP Policy which would allow un-approved GMOs into our food system, shifting away from our current policy of requiring ALL GMOs to be registered and have passed the CFIA’s screening of company documents – which already is arguably an insufficient process within a flawed “science-based” model. OCO argued the new policy is trade-based and has no basis in science, putting at risk not only Canadian consumers, but our agricultural landscape as well. Attended the Ontario Livestock and Poultry Council meeting. Mary Wales, working with OCO through CAAP as our Communications Coordinator, had her first meeting with this group of commodity organizations. The OLPC was formed to develop pro-active bio-security measures, and OCO is at the table to ensure the group considers agro-ecological approaches and organic certification when recommending policies or programs. Meeting with New Directions Research Coordinator Theresa Schumilas to plan 2013 KTT (Knowledge Transfer and Translation) activities for our research findings. The project examined information systems needs and recommendations for Ontario moving forward to characterize the organic sector. With consistent and transparent data, businesses can make responsive, adaptive and innovative business decisions and government can develop targeted programs and investments in organics. Worked with FarmStart to instigate a national conversation on Farm and Finance. As part of our CAAP project, OCO is investigating the need in our sector for alternative approaches to financing, as well as models in other jurisdictions and disciplines that are working for socially-minded investors and entrepreneurs. The conference call last week included Toronto Food Policy Council, MaRS, McConnell Foundation, FarmStart, Food Secure Canada and other engaged and inspiring groups. Thanks to Christie at FarmStart for her leadership and FarmStart’s previous work in this area, and to Sustain Ontario for providing the network and facilitation. Lead OCO monthly Board Meeting. 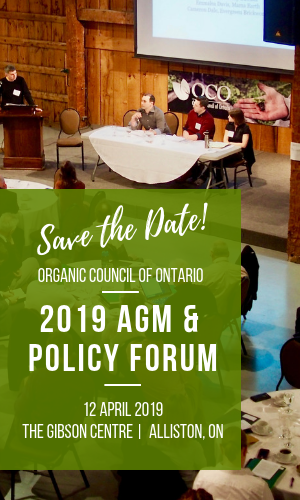 Agenda included review of OCO’s finances, getting updated and providing guidance on our Consumer Co-Farmer Member Campaign, and initial planning of OCO’s March 21st Annual General Meeting.